Charming house in Old town near the cemetary and 3 blocks from Duval. Complete renovation with new Central Air (2016), full kitchen and heated pool. 2 Bedrooms (King and Queen) and 2 Full Baths each with shower. Parking available for additional charge. Premium Cable. Home comes with weekly maid service. Books very early with 100% returning guests. We are only looking for responsible and respectful guests. You will love it. We have owned this property for many years. We have rented it infrequently and a great community of guests has been built around Elizabeth Street. Most return annually if not several times during the year. We have met so many wonderful people through renting our home. This house is very special. Its a place for relaxation and taking full advantage of everything Key West has to offer. The home has a wonderful front porch for relaxing and a beautifully landscaped private pool area for very private relaxation. House has variable supply of olive oil, condiments and seasonings. Private back garden with pool, outdoor dining table, grill and chaises for lounging. Private heated pool Gas Grill Parking available behind the house. We so enjoyed our stay here! The house was clean, cute and a great location. The back deck and pool was an enjoyable place to unwind or plan our day. The owner/management were very helpful and accommodating! Would love to come back!! The best of the best in Key West! The perfect home for 4 people in so many ways! 2 Blocks from all the action on Duval Street. A secluded backyard with a heated pool, outdoor eating area & a couple of loungers. Inside is a beautifully decorated abode with soaring ceilings everywhere so it feels bigger than the conch home is actually. Just right & well afforded with luxury linens, overhead fans in all the right places & air conditioning. All the amenities you would think you have to bring to a rental, you really do not! Everything is there at your disposal. It is so nice you take pride in keeping it that way! Donald, the owner Sombra, the manager & neighbor Eddy are all so helpful. Anything you are interested in, they have a recommendation. Bike rental from Eaton Cycles was one of the recommendations. Our bikes were dropped off & picked up at no charge. As you read all the reviews for this home, just know that it has tender loving care in every corner the place. We hope to be back in the future! Thanks again for an exceptional week. Melissa & Greg, (Andy & Margie). What an amazing home, we have stayed in many houses in Key West over the years and this was our favorite! Perfect location, quiet but close to all. The back deck and the pool were over the top! The home was spotless and very welcoming. The owner and the manager were such a pleasure to work with, informative, gracious, and accommodating...we arrived one day early due to Hurricane Matthew and were very pleased to find this didn't pose any problem. Thank you for a terrific week, you all are at the top of our list and we will be back as soon as possible! I stayed at this property during a long weekend getaway with friends, and was very impressed! The home was very clean and welcoming, with a layout and location that was ideal. Close in proximity to restaurants and attractions, but in a quiet, private area. The back patio and pool area was especially enjoyed during our stay - it was completely private and was the perfect area to lounge and relax while taking a dip, getting some sun, or enjoying an evening cocktail! The open concept kitchen area was also appreciated, as it was easy to socialize with others in the living room or patio area while preparing meals. I hope to go back! My girlfriends and I stayed at this beautiful home for a weekend getaway, and it was amazing to say the least! The house was clean, spacious, and accommodating. It can be difficult to find a location that comfortably fits 7 girls, but this place was a perfect match! The pool in the backyard was private and was perfect for relaxing and hanging out during the day and at night. One of my favorite things about this home was the location to the restaurants and bars. We were able to walk everywhere which made our stay that much better! I can't wait to go back and would recommend this location to anyone looking for a wonderful place to stay and relax in Key West! The property is located on Elizabeth Street which is a close walk or bike ride to Duval Street. 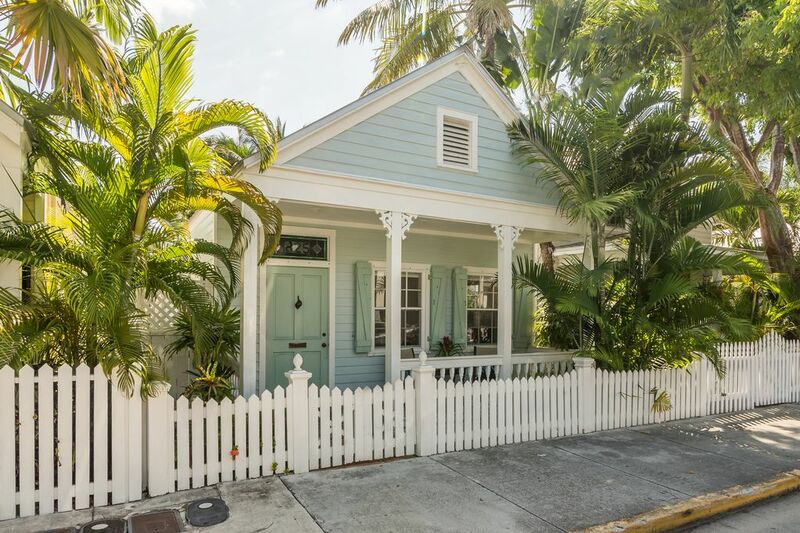 The house is a typical "conch" house and is situated in a traditional Key West area. The house is a quick bike ride to just about anywhere is Key West. There is a gym, grocery store and pharmacy all within walking distance. Beyond Duval Street, there are a number of bars and restaurants in the area.